AT&T's reputation in the more tech savvy hubs of America has taken a beating since the introduction of the iPhone. Cities which generate a lot of smartphone traffic like San Francisco and New York have been cities where AT&T is notorious for having dropped calls and poor service. 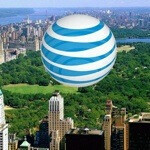 It looks like AT&T is trying to appease customers in NYC by offering free WiFi in parks across the city. This morning, NYC Mayor Bloomberg and AT&T CEO Randall Stephenson announced the deal, which will have AT&T offering free WiFi in 26 locations in 20 parks throughout the 5 boroughs. This comes after NYC had shut down its own initiative to offer free WiFi in 10 parks which ran from 2004 to 2009. The deal with AT&T will span 5 years. AT&T giving free wifi wow,i bet they are gonna charge for it later.